A salad with blue cheese, dried cherries or cranberries, pecans or walnuts, maybe some chicken, and raspberry vinaigrette. 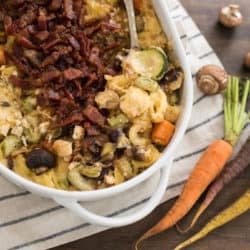 What is this type of salad called in your neck of the woods? Here in Michigan, it’s widely referred to as “Traverse City salad,” after the city in the northern lower peninsula that is world famous for it’s cherries and annual cherry festival. In other parts of the country, I think it’s mostly called a “Sonoma salad,” although I’m not sure of the origin of that name. Is this salad popular in Sonoma wine country? To be honest, it doesn’t really matter what you call it, just as long as you make it and enjoy it. Here, instead of traditional mixed greens as the base of this salad, I went with pasta. 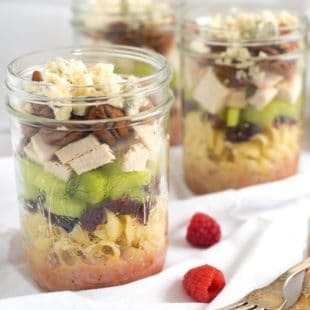 But to call it a “pasta salad” is kind of a misnomer, because it’s like 20% pasta, 80% good stuff like chicken, earthy and creamy Stella® Gorgonzola cheese, crunchy nuts and celery, and sweet dried fruit. 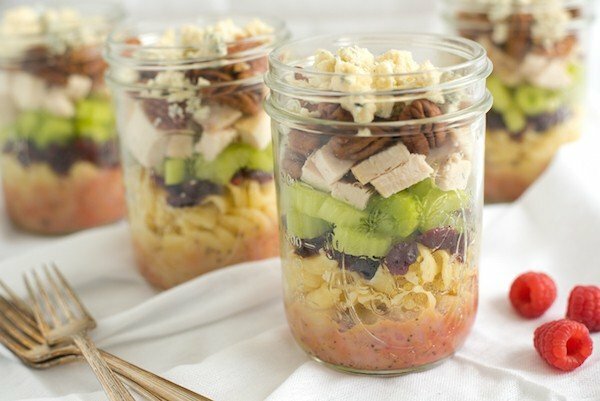 These Sonoma Chicken Pasta Salad Jars are portable, adorable and delicious, which is kind of the trifecta in my book. Cook pasta according to package direction. Drain and rinse with cold water. Meanwhile, make the Raspberry-Poppyseed Vinaigrette: In food processor or blender, process raspberries, vinegar, honey, sugar, salt and pepper until smooth. Add oil; process until all oil is incorporated. Stir in poppyseeds. 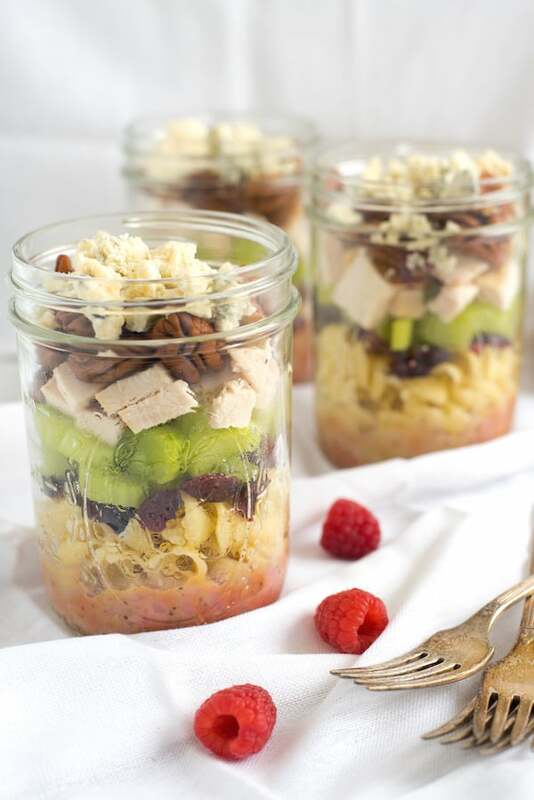 Divide Raspberry-Poppyseed Vinaigrette equally among 4 pint-sized mason jars. 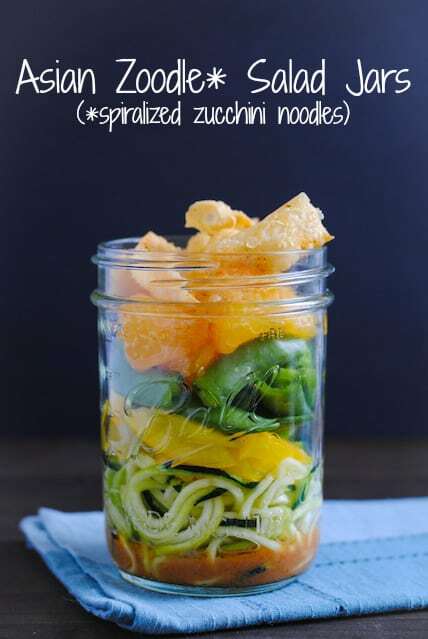 Divide pasta over dressing; layer remaining salad ingredients. Top with lids and refrigerate up to 4 days. To serve, pour onto plate or bowl, stir and enjoy. Who knew that Traverse City salad was my favorite?? 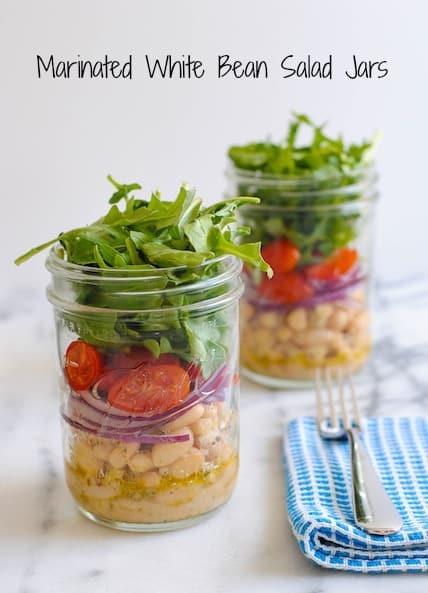 All my favorite salad ingredients in one—and so darn cute in those jars! Brava! Thanks so much, Liz. I wish I had a delivery drone so I could send one to you for lunch! 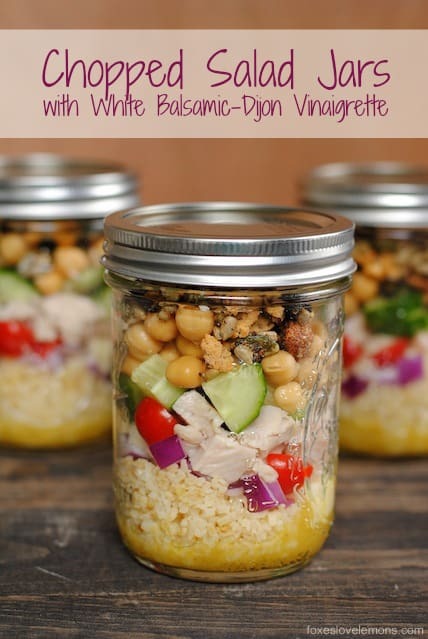 This would be an amazingly delicious lunch and so handy in the jars! Thanks so much, Lori. Jars really are so convenient to store and tote around. 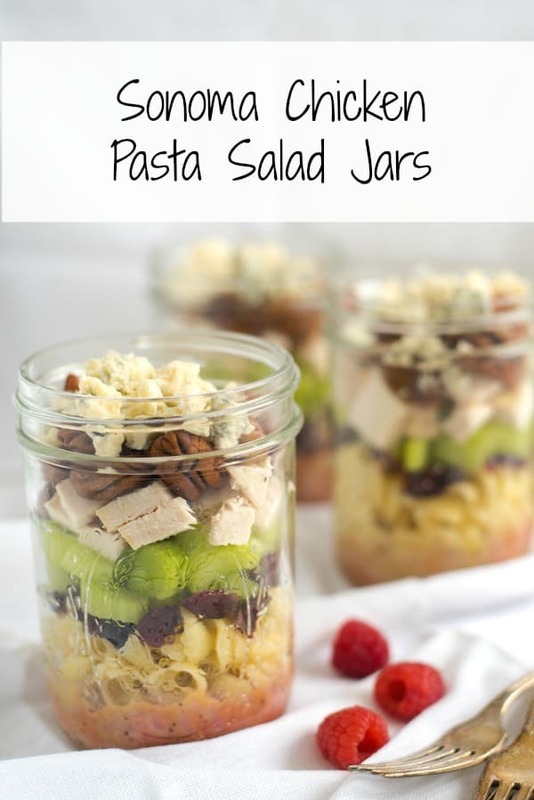 I love salad in a jar! Just made eight spinach fruit salads today for the week. This will be on my list for next week. Thank you. Thanks Heather! Spinach and fruit salads sound great. What fruits did you use? Strawberries, blueberries, and mangoes with a balsamic vinegar and olive oil dressing. A few cashews on top and for me a smattering of blue cheese. It was great today! Gorgonzola and cherries are perfect together. Now, if only I had this salad for lunch today. Pinned. If only I had we had a delivery drone. Seriously, when are those things gonna be available? I would shoot you a jar ASAP. Ba ha ha, Karly! I love it! 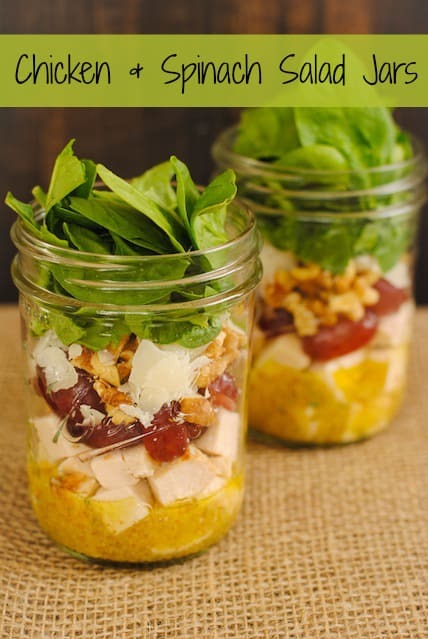 I love all of your salads in jars, but this might be my favorite. The cranberries, chicken and gorgonzola (along with the tasty dressing) is an amazing combination! Awww, thanks so much Alida! It’s hard choosing a favorite jar (like choosing a fav child? ), but this one really ranks up there for me, too. I’m working on portion control as a way to change my eating habits. 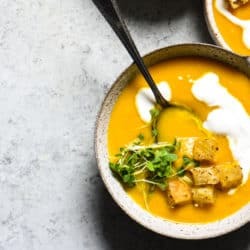 When I read this recipe, I thought “there is no way that is going to fill me up” but it did! I have had it for lunch the last three days and it was perfect. With a piece of fruit for an afternoon snack, it carried me through until dinner. It is a really good balance of protein, carbs and yummy stuff! That looks really good! 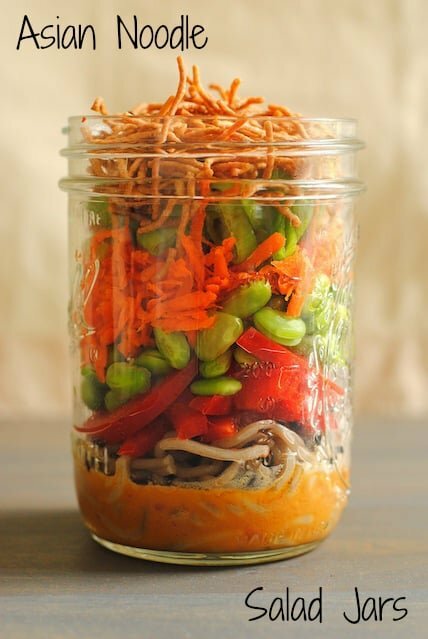 Do you eat it out of the jar or put it in a bowl? If you make a few jars at a time, how long will they last in the fridge? 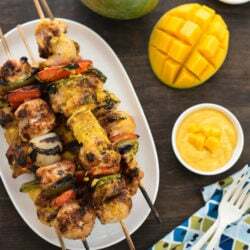 Hi Rahul – for a boneless chicken breast, I would suggest cooking at 400 degrees F for 20 – 25 minutes or until the internal temperature of the chicken reaches 165 degrees F.